Technical analyst Clive Maund charts a young gold company that he believes "is going places." 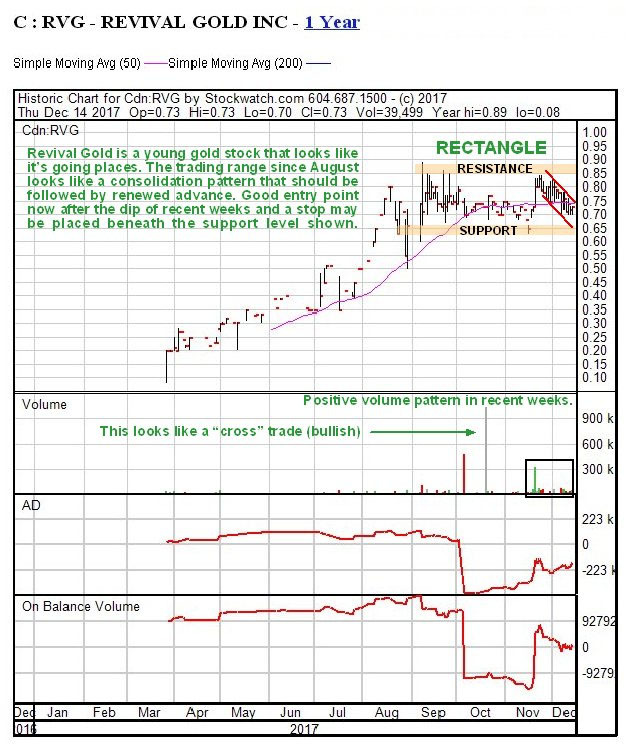 Revival Gold Inc. (RVG:TSX.V) is a young gold stock that looks like it's going places. After starting trading in March it immediately went into a steady uptrend that later accelerated into a peak in August–September, after which it ran off sideways into a rectangular trading range that has continued up to the present, as we can see on its 1-year chart below. This trading range looks like a consolidation pattern not a top, and if so we can expect the price to break above the resistance at the top of it in due course and enter another uptrend. With the gentle downtrend of the past few weeks having brought it down towards the lower boundary of the trading range, it looks like a buy here, and a stop may be placed beneath the support at the lower boundary of the range, in case it does the unexpected and breaks lower. Note that although Revival is a stock traded on the Canadian Venture Exchange and the U.S. OTC market, its chart is not available in Stockcharts, hence this Stockwatch chart.